Spandex is for chumps. Seriously, who wants to save the world looking like a vacum packed Rainbow Brite? Real men (and women) wear kevlar, leather and other durable materials - but not candy floss, that shyte just attracts flies and starts rumours. Swatting those flies aside, this edition of Now Comes The Cosplayer is dedicated to all those peeps who laugh in the face of spandex - ha! - or simply shoot it full of holes. Behold! Lots of folks do The Punisher, but few get the outfit as good as this guy. If he just looked a bit more on the rougher side of clean-cut, I'd say Marvel would've found their new poster boy for what any future Punisher movies should aim for. That is if they don't sign Thomas Jane back up for the role. The Enchantress - out to prove Thor's not the only long-haired blonde in thigh-high boots that can make a Jack Kirby look work, cosplayer JoEllen Elam's stare really lives up to her adopted namesake. Great stuff! Ghost, from Dark Horse Comics is a character few realise can turn invisible, because unless it's her breasts that are fading from sight, few fanboys notice. Heck did you notice her cape was fading away here? Or were you still looking where she holsters her pair of Colt 45's? 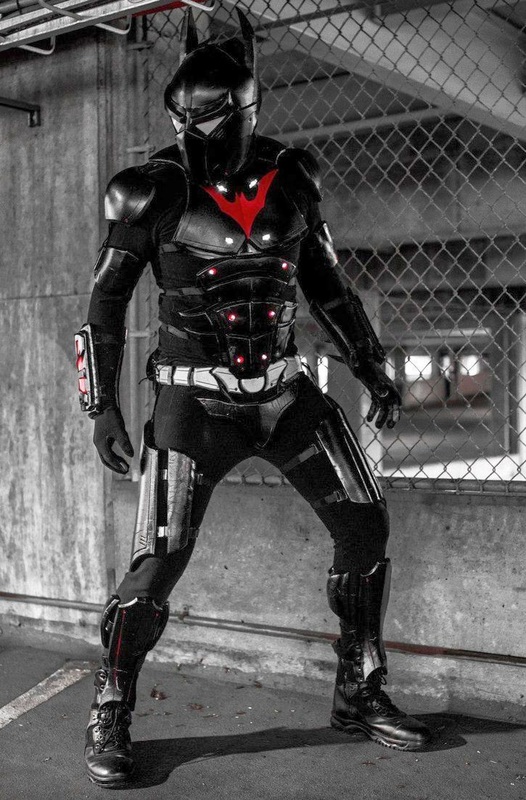 This Batman Beyond has to be one of the best cosplays I've seen. Sure he's kitted out a Paul Dini trademark slim style costume with pads and gear, but I'll be damned if it doesn't breed the awesome. Built by US Cosplayer Shannon, the helmet even gives his face a part Predator look - and there's no way you want to mess with that! The Ghost one is incredible! Thanks King and Karl! Ghost is a pretty awesome character, but finding cosplay of her can be pretty hard going. Not only does this lass do a great job, she gives the comics a plug too! DAT GHOST!!!!! I'd love for her to phase thru me. GODDAMN! And finally good on the Batman Beyond guy. Street level but doable as an outfit. Thanks Dale - seems like Ghost is more than raising the dead this week!